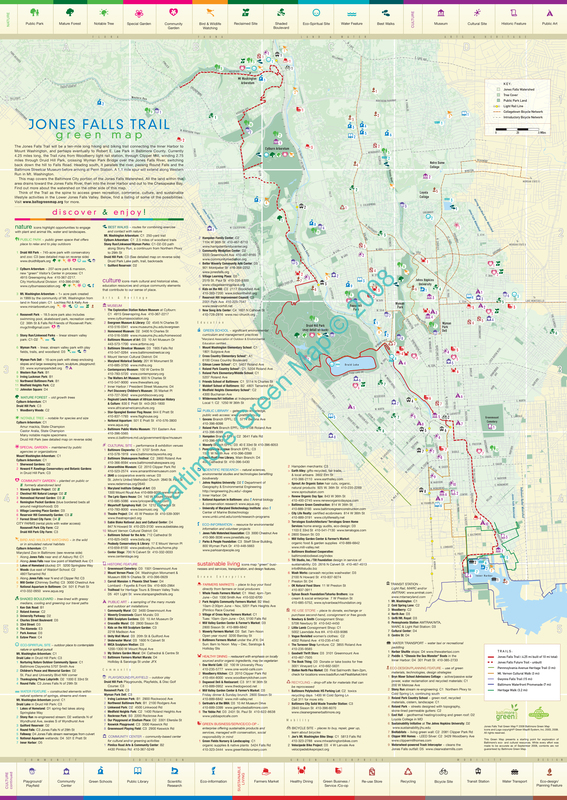 When complete, the Jones Falls Trail will extend 10 miles between Baltimore's Inner Harbor and the Mount Washington Light Rail Station. Currently, a paved, off-road section runs from the Woodberry Light Rail Station south to Penn Station. A highlight of the journey is passage through Druid Hill Park, which offers a natural escape from city life. The park houses the Baltimore Zoo, the Rawlings Conservatory and Botanic Gardens, and many other historical structures. After exiting the southeastern side of the park, the character of the trail's surroundings becomes more urban. Along the way, the Baltimore Street Car Museum is a worthwhile stop. The on-road portion of the trail begins past Penn Station and whisks you south to the Inner Harbor, a major tourist destination with restaurants, shops, museums, and other attractions. Navigating this section of the trail can be somewhat tricky; look for painted green trail markings along the ground to help guide you. Just before the Inner Harbor, you'll pass the Phoenix Shot Tower, a red brick pillar built in 1828 that stands more than 200 feet above downtown. Molten lead was once dropped from its top into a vat of cold water at the bottom to produce shot for pistols, rifles, and other weapons. It's one of only a handful of similar buildings around the country. Construction of the trail's northern segment, from Druid Hill to Mount Washington, is underway and will incorporate Cylburn Arboretum and Mount Washington Arboretum. The trail is open during daylight hours. There are no fees for using the trail. The current length of the trail provides 1.5 miles of paved walkway access from activities at Druid Hill Park (swimming pool and tennis), to the overlook at Round Falls, Baltimore Street Car Museum and Penn Station. Public restrooms are available across from the trailhead in Druid Hill Park at 3001 East Drive and at Penn Station. The trail is handicapped accessible. The surface is macadam. Some sections are relatively steep grade.